Some places just resonate with us as senior travelers. Exploring backroads America, most of our experiences have taken us far beyond sightseeing. Growing up on the plains, I was exposed to Pow Wows, Native lore and art. My grandmother could remember living in a sod house in central Kansas! Native American culture, but more to the point, Native American dignity and sense of oneness with the earth has mesmerized me for decades. We learned about Navajo harmony on one of our favorite trips. We love photographing and exploring the Slot Canyons on Navajo Nation lands in Page, Arizona. It is one of our very favorite places in America. The canyons whisper of mystery and generations gone before. 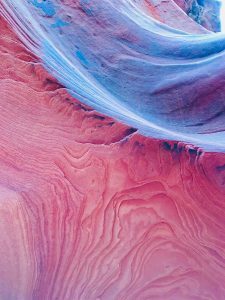 There are swirls of sandstone that literally take your breath away. Retirement travel gets no better than this! The Navajo people in the American Southwest leave us as breathless as the landscapes. In the windy vastness of the Navajo Reservation in Arizona, two men touched us deeply. Robert, an elder, and Trey, a young man barely in his twenties, taught us much about living in harmony. In trying to sum up how they lived and what they were saying to us, we turn to Edward Johnson Little of Tuba City. See Robert’s description of what Navajo dance means in our post, “Exploring Page, Arizona“. 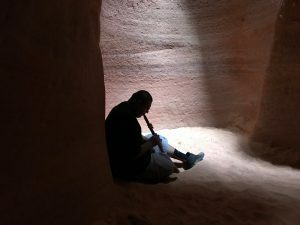 Listen to Trey playing in the Slot Canyon to share just a bit of our experience. Trey played for us in the Horseshoe Bend Slot Canyon. Question: Has a travel experience created Harmony for you?